When vegetables are roasted, they lose their plant-like flavors, becoming sweet and almost decadent. Here are four wines to pair, depending on which veggies you roast. Brussels sprouts and broccoli. 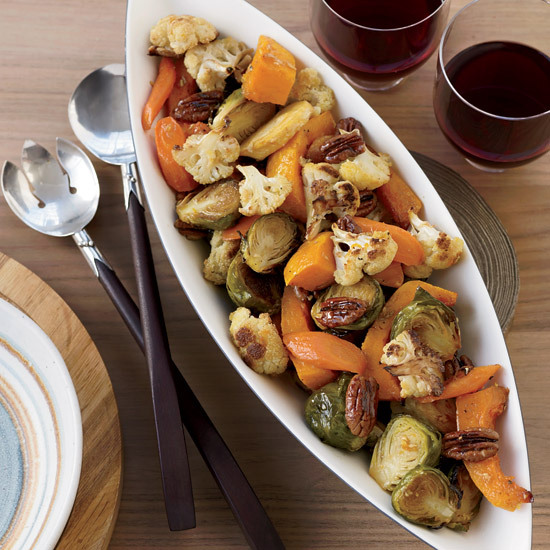 Even when roasted, these cruciferous vegetables have a slightly green flavor, so pairing them can be tricky. White Bordeaux is a good pick—it’s usually made from grassy Sauvignon Blanc and honeyed Chenin Blanc. Try the 2013 Château La Rame Bordeaux Blanc. Squash, carrots, cauliflower and parsnips. Chenin Blanc can have a rich texture that’s terrific with these sweet caramelized vegetables. If you’re open to off-dry wines, try the 2012 Philippe Thierry Tuffeau. If you prefer a dry wine, go for the 2011 Vincent Raimbault Bel Air. Tomatoes. Slow-roasted tomatoes become candy-like, retaining just a little bit of their natural tartness. Try them with a dark-fruited rosé, like the 2013 Muri-Gries Lagrein Rosato.